During my first live show someone asked about LinkedIn, and I’ll be honest, it’s not one of my favorite networks so I decided to bring in some big guns. 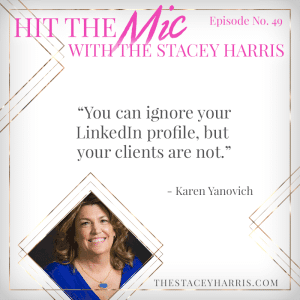 Karen Yankovich is a LinkedIn pro and breaks down the case for us giving it a little more of our time. I’ve been doing more with LinkedIn since I first met Karen and I’m already seeing some benefits in the expansion of my brand. I haven’t seen it convert to a client (not directly) anyway but these things take more than a couple of weeks. Check out our chat and be sure to connect with me over on LinkedIn. Be sure to leave your review on iTunes or Stitcher for a shoutout on a future show.